Reading and share top 16 famous quotes and sayings about Life Is A Gift by famous authors and people. 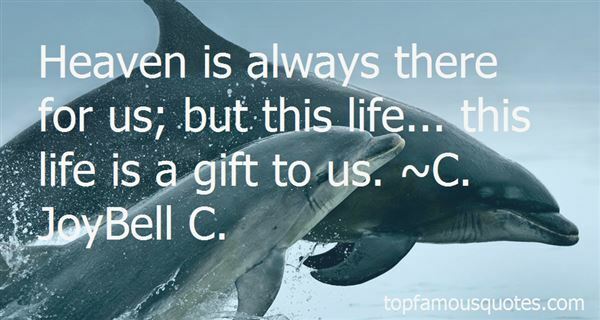 Browse top 16 famous quotes and sayings about Life Is A Gift by most favorite authors. 1. "Life is a gift from the Gods. Why give it back by killing yourself?They don't want you to give their gift back to them.They want you to keep their gift,give it value,develop it and make it into something that will be remembered.Some people ruin their gifts.They do not care. Do not run away from challenges..face them. The Gods want you to fight the challenges and to overcome them. Challenges are yet another part of life.Preserve.develop and let your life be remembered.Make use of your gift instead of storing it away in a place where no one will see." 2. "Be grateful with what we have .. because life is a gift of God"
3. "Life is a gift, given in trust - like a child." 4. "The deeper we grow in the Spirit of Jesus Christ, the poorer we become - the more we realize that everything in life is a gift. The tenor of our lives becomes one of humble and joyful thanksgiving. Awareness of our poverty and ineptitude causes us to rejoice in the gift of being called out of darkness into wondrous light and translated into the kingdom of God's beloved Son." 5. "Heaven is always there for us; but this life... this life is a gift to us." 6. "Life is a gift full of riddles in which suffering and happiness are inextricably intertwined. Any attempt to have one without the other was simply bound to fail." 7. "Life is a gift and a challenge." 8. "Patience is a tough lesson to learnIt's a reward we wisely have to earnBut mastering it brings a paradigm shiftAnd we finally realize that life is a gift"
9. "Loneliness is something that finds us all when we think about it and when we're by ourselves when we don't want to be. It creeps up when we desperately feel like we need someone special but can't seem to find anything more than a friend that wishes they could help. Sometimes a friend cannot be found when your willing to settle for one. Sometimes it passes quickly, and sometimes it sticks around to try to drive us to insanity. Its like a creature lying in wait to take us at our weakest moment, but only toying with us when we give up to it. In the end it always passes. There is always something to appreciate and someone to cheer us up. We adapt and overcome. Life is a gift with much more to it than a passing emotion. All around us are beautiful things to console us. Life is much more than one feeling. It is as great as we let it be." 10. "In the letter he left for the coroner he had explained his reasoning (for suicide): that life is a gift bestowed without anyone asking for it; that the thinking person has a philosophical duty to examine both the nature of life and the conditions it comes with; and that if this person decides to renounce the gift no one asks for, it is the moral and human duty to act on the consequences of that decision. ... Alex showed me a clipping from the Cambridge Evening News. 'Tragic Death of "Promising" Young Man.' ... The verdict of the coroner's inquest had been that Adrian Flinn (22) had killed himself 'while the balance of his mind was disturbed.' ... The law, and society, and religion all said it was impossible to be sane, healthy, and kill yourself. Perhaps those authorities feared that the suicide's reasoning might impugn the nature and value of life as organised by the state which paid the coroner?" 11. "...life is a gift bestowed without anyone asking for it; that the thinking person has a philosophical duty to examine both the nature of life and the conditions it comes with; and that if this person decides to renounce the gift no one asks for, it is the moral and human duty to act on the consequences of that decision." 12. "This life is a gift, and to reject that gift or abuse that gift is not human and not worthy of us." 13. "Life is a gift, and should be cherished, lived and experienced. Though experience often reveals itself as pain in this world, it is still purposeful, it still has its place in the evolution of our spirit." 14. "Life is a gift...Life is a test...Life is temporary assignment...."
15. "If life is a gift, then the more you partake in it, the more you show thanks." 16. "Life is a gift, and it offers us the privilege, opportunity, and responsibility to give something back by becoming more." If you promise the moon, be able to deliver it."